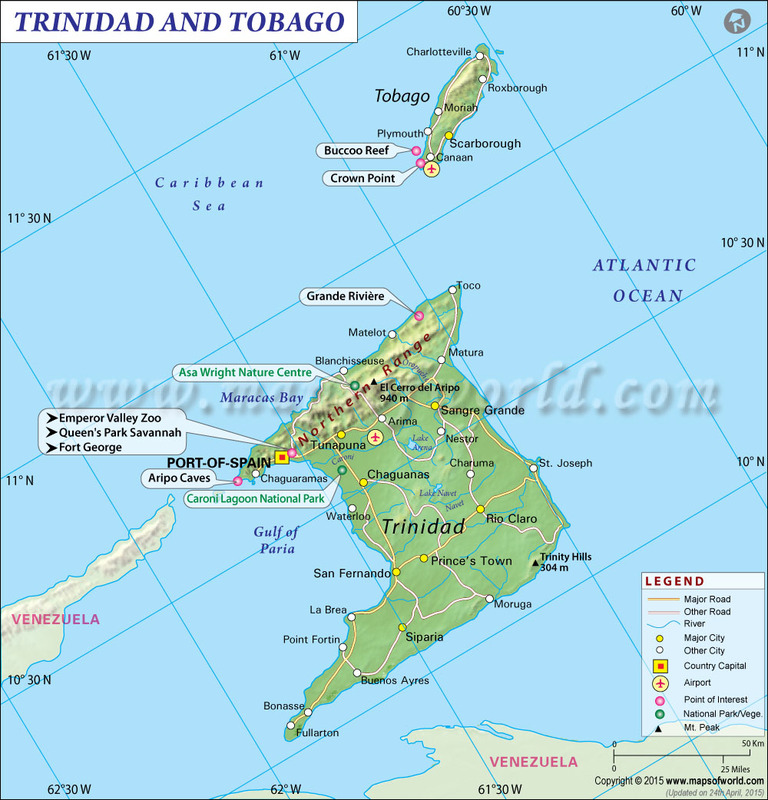 Trinidad and Tobago, an island country, is located in Caribbean Sea. Trinidad and Tobago is renowned for its Carnival. The capital city is Port of Spain and the largest city is Chaguanas. Trinidad was discovered by Christopher Columbus on July 31, 1498, during his third voyage to the New World. He named the island after the Holy Trinity. However, the island was ignored for years before the first attempt at settlement was made in 1531. The first permanent settlement was established in 1592, through the efforts of Domingo de Vera, who founded the old capital of St. Joseph. The island was a haven for pirates and smugglers during the 17th century, which led to very little development. By 1797, Trinidad became a British sugar colony. Tobago was also discovered by Columbus at the same time as Trinidad, and he named it Bella Forma. However, the name of Tobago is taken from tobacco - which was grown by the original Indian inhabitants. In 1608, James I claimed sovereignty and for the next 200 years, the island was given back and forth to the Dutch, the French, and Britain. Just like Trinidad, Tobago became a haven for pirates and smugglers. In 1763, Tobago was handed over to the British by the French, eventually becoming a sugar colony. Recession of the sugar industries occurred in the late 1800's, forcing Britain to merge colonies to cut administration costs. Trinidad and Tobago were united in 1899 and became a ward of the colony. Oil was discovered in Trinidad in the 1900's and it dominated the economy, transforming parts of the islands from rural to urban municipalities. Trinidad and Tobago became an independent member of the Commonwealth on August 31, 1962, and a presidential republic within the Commonwealth in 1976. Trinidad and Tobago consist of the 2 main islands and other smaller landforms such as the Huevas, the Monos, the Gaspar Grande, Chacachacare, and the St. Giles Island. It is located in South America, 11km off the coast of Venezuela. The terrain is a mixture of mountains and plains, where the majority of the population live on the island of Trinidad. Trinidad and Tobago is a republic with a 2-party bicameral system that is based on the Westminster system. The President is the head of state and the Prime Minister is the head of government. The President is elected by an Electoral College that consists of both houses of the Parliament, while the Prime Minister is elected through general elections every 5 years. The Parliament consists of the 31-seat Senate, and the 41-seat House of Representatives. The Senate members are appointed by the President while the members of the House of Representatives are elected through general elections. Tourism is not a major industry in Trinidad and Tobago due to its economic dependence on oil and natural gas production. And because of this, many of the nation's natural resources are unspoiled. The must-do tourist attraction in Trinidad and Tobago is the Carnival, celebrated during the Monday and Tuesday before Ash Wednesday. Considered to be one of the greatest shows on earth, the Trinidad and Tobago Carnival is celebrated by both islands but the liveliest can be found in the capital of Port of Spain. Masquerade bands, people in extravagant costumes, outdoor concerts, and street dancing are part of the nationwide celebration. The Maracas Bay which is home to the Maracas Beach is the most popular beach in Trinidad and Tobago. It is sheltered inside a U-shaped bay, and famous for its crystal clear waters and powdery white sands. It is found an hour from the capital, and the drive going to the Bay is equally as beautiful - with roads along the mountainside offering spectacular views of the water and nearby mountains. Fort George is found in the Port of Spain and can be reached by taking a hike to its 1,100 feet elevation. It provides sprawling views of the city, and its old buildings and structures are still intact - making it a historical site with barracks, canyons, lookout stations, and a working lighthouse. Its landscape is also well-maintained, making it the perfect place to have a picnic in the capital. The people of Trinidad and Tobago are considered to be one of the most educated in the world - mainly due to the country's free education from kindergarten to university. Education is free and mandatory from age 5 to 16, which includes free transportation, free books, and free meals for primary and secondary students. Tertiary education is also free up to the Bachelor's degree level in the following higher education institutions: University of West Indies, the University of Southern Caribbean, the University of Trinidad and Tobago, the College of Science, Technology, and Applied Arts of Trinidad and Tobago, and many other accredited institutions. The Moruga "Scorpion" pepper of Trinidad is considered to be the hottest pepper in the world by the Guinness Book of Records. Pitch Lake in Trinidad has the world's largest natural deposit of asphalt - consisting of 99 acres and 246 feet deep. The Limbo dance originates from Trinidad. During the 2006 World Cup, Trinidad and Tobago became the smallest country ever to qualify to the World Cup. Note : -Population and area: 2000-05-15 census. The flag currently representing Trinidad and Tobago was officially adopted in the year 1962.